Here you can find a strain description about Viking (Derg Corra) and also some user-based reviews and infos directly from the SeedFinder (if available). You can also find the offers and auctions here if Viking (Derg Corra) cannabis seeds are on stock at MyCannapot right now. 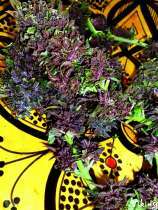 Viking is an old Dutch strain probably made from an Afghan landrace. She shows purple hues in flower and brings on a sweet hashy taste with earthy undertones. She's very easy to grow out- and indoor aswell. This strain is very muscle relaxing, and is very good for insomnia too. Couchlock effect. The reproduction of this strain was made by Bald Man Lala for the Derg Corra Collective. Buy Viking (Derg Corra) now at MyCannapot!